August | 2008 | Suzi's Knits: Footfalls & furballs! More (in focus) marathon photos up! My overpriced photo CD of professional marathon photos has arrived and been uploaded. 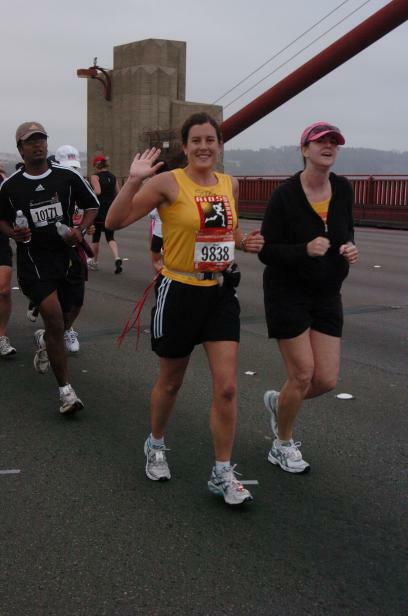 Here you see a shot of me and my running mate, Melissa, on the golden gate bridge, still full of energy after jsut 6-8 miles or so. The images are in no particular order on the website, and too many of them have me holding fingers over my head saying how many miles I’d gone, cuz I was too damned tired to realize it would look better to just wave (and I kinda wanted to know where I was). Anyhow, all are actually in focus so you should check them out. You have photographic PROOF that I crossed the finish line now! 😛 Copyright details – free for personal use, so if you want a copy on your wall go ahead and print them. We have marathon photos up, both from the pros at the race course and from Peter’s digital camera. And hopefully our friend Rob will get his shots to us soon too! Today was the first day I went out running since the marathon. 😛 feelign pretty good until I started, then realized those legs are still healing. But 😛 I still managed to beat Peter’s 3 mile time with 32:40 so I’m happy… They boy says he’s happy to have a shared hobby where I’m the expert for once. Most of the things we do together, he’s either more into the tech (scuba) or just have been doing it longer than I’ve been alive (skiing). Well, ladies and gentlemen, I have completed my first marathon with a time of 5:40:21 and have the big coaster sized medal around my neck (they actually put little foam thingies on the back so it could actually be used as a coaster should you be so crass as to wish that…) It was about the perfect day for it – foggy and cool, with the sun peeking out sometime while I was in the shower. The bridge and view of city from Marin were awesome – everything all streaked with foggy light. Melissa and I set off together and finished about half until we hit a hill where I couldn’t stop running and her legs weren’t up to it, so we split up. I was too brain-dead to wait at the end, but it looks like she ended up just 1 minute behind me. GO MELISSA! Another fun part of the course was 90% of the course control volunteers were a gang of a few hundred motorcyclists, all with lots of medals and charms and big fat hogs. Great bunch. I do have a few comments, BTW, if you ever volunteer at a marathon… “you’re almost there” – please don’t start saying this at mile 20 when we’re all struggling to keep moving and there’s a good hour plus of running left to do! Keep it up, you look great, going strong, all there are welcome. But you’re almost there… for 5 miles we heard this. oddly enough, when were WERE almost there… it shifted to “just 2 more miles” and the “keep going to the finish” and such. Also I wanted to note for people odd stuff in my mile splits. I look shockingly consistent 😛 We so weren’t… the first half was all 12-12:30 min miles, with one mile (5) that was walked uphill, and a 3 min pit stop at mile 8. I gather I stuck CLOSE to 12/12:30 for the 3rd quarter, but that last 6 miles…. those were 14-15 minute miles, WITH me running per schedule. I let myself drop back to a 3:2 ratio somewhere, I really can’t remember where, and stopped listening to the watch and just running after the VERY WELCOME 26 mile marker. I managed to find somewhere (I really don’t know where, half a mile back I wasn’t sure I could run after a walk break) enough energy stolen blatantly from the crowd to put on an extra burst of speed for most of that last .2 and crossed the line in style, too oblivious to even know Peter was right there… 😛 took me several minutes to find him and he saw me the whole time. I was totally brain-dead and still moving forwards (toward the medals, then towards the bananas). All in all it was a good race. not really sure I’m addicted to them, tho. The first half was genuinely fun. The last half was really mostly just work and finishing what I set out to do. I’ve got 2 half marathons schedules (SJ rock and roll Oct 5, Big Sur half Nov 9) and am looking forward to them, and think I’ll stick to halfs and 10K’s for a while. Wow, I simply can’t believe that in 2 days from now I’ll be finished with my first marathon! I’m very excited, a little nervous, and still feeling ready. Taper’s been good – the last of the stiff muscles from 3 weeks ago have faded and I’m really feeling antsy. I never did get around to saying more about the 26 miler. All in all it was a good experience. I dropped back to a slower group since I’d not finished the 23, and off we set. Peter came along and manned a water stand too, somewhere around miles 5/16 I think. Right before the REALLY BIG 5 BLOCK LONG HILL. It’ll be a long time before the coaching staff is forgiven those hills… 😛 We set off from the park, along Lake, OVER the hill toward the marina, and along the Embarcadero. it was a great time, since the half marathoners started passing us on the way back at around mile 6, and then around mile 8 or 9 we started to see the return of the elite runners, so there was lots of support and encouragement. then out on the embarcadero, there were even a few people who recognized the program and decided to cheer. my feet sped up, suddenly I’m leading the group… 😉 This is about where I realize not only will i make it thru today (mile 10 and no knee issues, YAY!) but that it’ll be no problem going faster on race day because, well, I’m an extrovert and performer at heart and people will cheer. If people cheer, I WILL keep going. (YOU ALL COME OUT AND CHEER YOU HEAR?) We turn around about 10.5 miles in, go back UP the hill (curse you coaches! 😉 give Peter a big sweaty hug and keep on going in one big mob of 12 runners. Its really funny, running 26 miles… Honestly, around mile 18 I’m still flying high and making odd statements like “wow is that mile 18 already? I’m not even tired yet…” By mile 20 the pace group is falling apart and my tune has changed to “sorry, can’t wait for you if I stop now I won’t start again” Instead of a large group of runners, we became a stretched out string of runners, each of us just putting one leg in front of the other. My knee had actually started to whine several miles ago, so I had to really watch my stride, cuz it would HURT if I got out of alignment, but I was fine if I kept in line. By mile 20 or so the rest of me hurt too so I didn’t care so much about the knee 😛 I started to really feel like a machine for putting one foot in front of the other, with pistons and gears instead of muscles and tendons. We came back into the park, and most of the way through it, then set off BACK through it for 3 miles to the AIDS memorial grove at mile 23. now, I’d promised myself that I’d walk the last 3, since I’d not done the 23, but the grove was so emotional – very shady and quiet. Coach was there and I think she was a bit concerned because I was crying. Really, seeing mile 23 on that sign, there in the memorial grove, was when I KNEW, down to my bones, REALLY KNEW I would make it. And of course I couldn’t stop running there. So I kept on at the walk-run pace for another mile or so before the emotion wore off and I remembered I was supposed to walk now to not hurt myself. And I got to watch oh, pretty much everyone in the long stretched out line of our pace group that I’d passed, pass me back. It was a slow walk 😛 I managed to pick up someone that also wanted to walk it in easy, and we finished the 26 plus the little recovery walk together. I hugged the 26 mile sign. A couple picnicking there said they’d seen a lot of that today… Right before you turn the last corner and get back to base station, they’d set up a sign saying “Run across the finish line!” We laughed and checked for the words “just kidding” on the back, and strolled across the line. Then Peter and I headed out for a really nice beach cantina lunch (I was starving to death, i swear) complete with seared ahi and a big Ben and Jerry’s banana split. 😛 I earned it, right? Just FYI I was up and walking the next day… 😛 even walking NORMAL by Tuesday and running again by Thurs. The 8 mile with the team went well, tho I think I was the only person in our little group that would agree with that statement. Mom, dad and Valerie were up, so Val joined me while mom walked. Then we headed up to Ottawa for the linux symposium. 4 people joined me for my runner BOF thurs (including one who is running the same marathon) and well, no one seemed to be awake Saturday, which was okay because I still got to see the only sun that day by getting up at the ungodly hour of 7. This week I’ve been taking it really eeasy, and sticking to the “no more than 30 mins, no really” rule. its kind of a letdown, really. I’m just feelign warmed up after 30 mins… But the up side is all the stiff muscles really do seem to have worked themselves out and I’m feelign ready to go on Sunday. We’ll take off tomorrow midday, check in for the race, and find a nice Italian place for me to stuff my face with pasta, then I hope to sleep before dragging my arse up at o dark o’clock for sunscreen, oatmeal and a date with my foam roller before meeting up with Melissa at 5:45 at the AIDS marathon tent, in more than plenty of time for the 6:25 tortoise wave start time. Off to packing my run bag!I’ll try to pop back on and leave my runner number so you all can track my progress on race day.